MULE MUSIQ originally consisted of 3 labels: MULE ELECTRONIC, MULE MUSIC and ENDLESS FLIGHT. The labels have continuously released a large number of artists to worldwide critical acclaim including many of the works of Kuniyuki Takahashi, Sly Mongoose (with a remix from Rub'n'Tug), ecologist (aka beat pharmacy) and Force Of Nature. The label's ethos is simply to release "good music" notwithstanding genre. 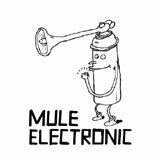 MULE MUSIC and MULE ELECTRONIC have become one label now: MULE MUSIQ. MULE MUSIQ holds regular parties in Tokyo by the name of ENDLESS FLIGHT and has booked cutting-edge artists such as Ivan Smagghe, Michael Mayer, Ewan Pearson, M.A.N.D.Y., Optimo, Joakim, Henrik Schwarz, Ata (Playhouse), Luciano and Lo Soul. MULE MUSIQ continues to be one step ahead in bringing cutting-edge sounds from Europe to Japan.